When I worked in Corporate America, I flew a lot. A LOT. My primary travel path was Chicago to San Diego and then across the border to Tijuana. That plane ride was over four hours long. You might not like that long of a flight, but I loved it. I could get so much work done! With most of what I do today, I travel via car. However, I traveled via plane last weekend to teach the Financial Learning Experience at C3 Church in Orlando, Florida. I had forgotten how awesome it is to be on a plane at 35,000 feet. I had such clear thoughts! 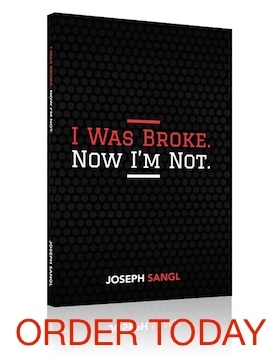 I was working on yet another revision of the I Was Broke. Now I'm Not. home group study that will be released in late July. The thoughts were so clear. I was on my game! I got so much done! I wonder why flying allows me to think so much clearer? I suspect it has something to do with the fact that nearly all of my normal distractions are removed (e-mail, friends, cell phone).